There’s A Buzz In The Air Across The Costa Blanca! AS SOME folks will know I have a fairly bizarre hobby – obtaining English language papers abroad and reviewing them for Counter Culture. In early September, I was in Spain for a very brief family holiday and was lucky enough to pick up a few papers. One of them was a freebie called The Weekly Buzz. 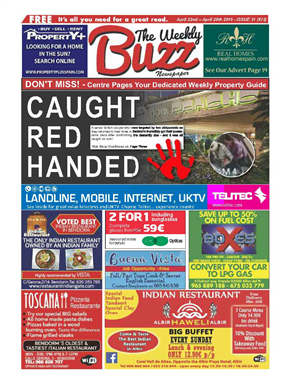 I got hold of issue 48 (dated September 9 – September 15) which means that The Weekly Buzz must be a recent addition to the growing number of English language papers centred in Benidorm. As a free paper it makes itself pay via advertising. My copy (consisting of 48 full colour pages) was absolutely crammed full of all types of adverts – some of which were really outstanding. Indeed, although I’m a vegetarian, the advert for the End of Summer Charity BBQ hosted by Monroes Restaurant & Carvery really caught the eye! I laughed out loud when I read the brief lead article on the front page which continued onto the centre page spread. In fact, I laughed so loud that my wife asked if I was ok! The reason? It was the news that “Heat FM Spain broadcasting live from their new studios in Calpe, Costa Blanca’s favourite hit music station have just landed a big catch in radio celebrity names.” The ‘radio celebrity name’ was none other than Vicky Locklin. Apparently she’s had stints with ITV Granada, ITV Tyne Tees and ITV Yorkshire. I’m not really into TV (although I do listen to plenty of different radio stations) and I don’t regard broadcasters as ‘celebrities,’ ‘stars’ or whatever. And to be brutally honest, I don’t really understand the mindset of those who do. So although Vicky Locklin has a lot of media experience, I’m afraid I wouldn’t know her even if I pulled her out of my stew! With this slight technical detail aside (!) I must say that I really liked the way that Heat FM (which you can find on 90.3 or 106.8 in case you’re wondering) sponsored the Entertainments & Showbiz section of The Weekly Buzz. I was also really impressed with its In Focus section, which devoted a page to number of smaller towns like Albir, Calpe, Javea and Moraira. Here I was able to learn about subjects as diverse as the family-friendly Interpretation Centre Faro de l’Albir and the Open Air Museum Villa Romana in Albir, the Fira L’Alfàs (a discounted shopping week) in Alfaz and the Costa Blanca Male Voice Choir who were performing near Moraira. I noted earlier that The Weekly Buzz is full of adverts. As a free paper it makes itself pay via advertising. Many of these are for properties – and these are very tempting, especially as every villa in the Costa Blanca seems to come complete with blistering sunshire, palm trees and a swimming pool! As with any community-style paper worth its salt, this issue also came with puzzle pages, a motoring section, health, TV, sport and much, much more. Main articles included a look at Benidorm Pride 2015 – https://www.facebook.com/benidormpride?fref=ts – flash floods (which we experienced first hand when we were over on our holiday) and the 70th Anniversay of Tomatina. I’d never heard of this festival before, but it turns out to be a tomato throwing festival – https://www.facebook.com/pages/La-Tomatina/108480779175799 – held in Buñol. At one point 50,000 people used to turn up to chuck tomatos at each other, but it’s now a ticketed event restricted to a mere 20,000 participants! During the event, people lob 150,000 kilos of squashed tomatoes at each other. Indeed, the festival is so popular that tickets for next year are already available! Along with the annual Festival of Moors and Christians (an old tradition that dates back to the 16th century which commemorates the confrontation that took place between Moorish and Christian soldiers in the 13th century over the rule of Spain) I wouldn’t mind taking in this tomato throwing festival.